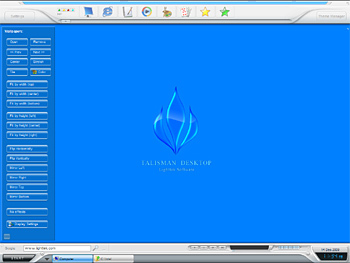 Unlike Windows themes, Talisman Desktop lets you completely customize the Windows interface. Its power extends from adding new toolbars to designing a brand-new desktop with any combination of drop-down menus, buttons and panels. Updated Talisman Tray. Added Sound icon in Talisman Tray. Added Power icon in Talisman Tray. Added dragging files on List objects in "Top forms". New "Gradient" option for menus. New "Scroll by Mouse Wheel" option for List objects. Updated "Themes submenu". Fixed bug in autostart procedure.